The vest has the side buckles. Because of how they are positioned, you’ll only be able to snug down the vest by about 1” per side for a total of 2” all around on both the chest and belly area (the equivalent of about 1/2 size). 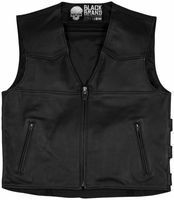 The Guardian Vest by Black Brand is a nicely styled black leather vest. It’s “normal” style is why I chose this one for our store. We’ve got a number of other more “mad max” style vests from Speed and Strength, Icon and others, but I know there are a lot of cruiser riders that like the vest style, but don’t want the “over the top” looks.